Public views of the Patriot Act, whose renewal is being debated by Congress, have changed little since the Bush administration. Currently, 42% say the Patriot Act is a necessary tool that helps the government find terrorists, while somewhat fewer (34%) say the Patriot Act goes too far and poses a threat to civil liberties. In 2006, the public divided evenly over the Patriot Act, with 39% saying it is a necessary tool and 38% saying it goes too far. In 2004, a slight plurality (39%) said it goes too far and threatens civil liberties. The survey by the Pew Research Center for the People & the Press, conducted Feb. 10-13, 2011 among 1,000 adults, finds that while overall opinions about the Patriot Act have changed modestly since 2006, Democrats express more positive views of the law than they did five years ago. Currently, about as many Democrats say the law is a necessary tool as say it goes too far (35% vs. 40%). In January 2006, 25% said it was a necessary tool while about twice as many (53%) said it goes too far. Over the same period, the proportion of Republicans who view the Patriot Act as a necessary tool that helps the government find terrorists has declined slightly, from 65% to 57%. 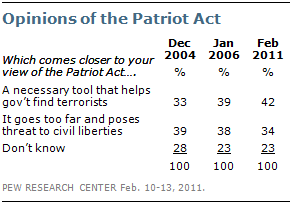 There is less public awareness of the debate over the Patriot Act than there was in 2006 or 2004. Today, just 32% say they have heard a lot (12%) or some (20%) about the issue. 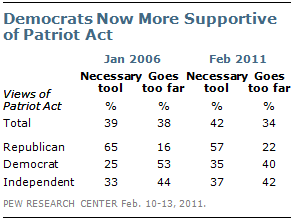 In January 2006, 51% heard at least some about the Patriot Act; 44% heard at least some about it in December 2004. Among those who heard at least a lot or some about the Patriot Act, 49% see it as a necessary tool while 41% say it goes too far. In 2006, opinion was more evenly divided among those who had heard at least some about the Patriot Act (48% necessary tool, 46% goes too far).